Volunteerism – get involved, damn it! I have written before about volunteerism and what is means to me. From volunteering at one’s school to participating in our civic processes, volunteering is a way to “give back” (I’m not particularly fond of that term) to the community and to gain a certain measure of self-satisfaction in the process. I have given up a lot of my free time over my adult life to a number of organisations, and I have learned much about myself and others by doing so. The type of folks who volunteer alongside me are, for the most part, the type of folks with whom I like to spend time, chat and share experiences. They are dedicated, hard-working and truly believe that what they are doing is valuable and necessary. And they are correct. That’s 154 hours, on average, for that 43.6% of the population that engage in volunteer activities. Put another way, that’s equal to just about 4 full 40 hour work weeks… and not paid a dime for any of them! Wow! So it turns out that those with jobs actually volunteer more, not less than the population as a whole. Pretty incredible, eh? Why the rant today about all this? Well, last night was my last AGM of the childcare services not-for-profit that I have been involved with for about 8 years. It has been a rewarding experience which has allowed me to have a small measure of influence over the childcare experiences of my two youngest kids. Some of my fellow Board members have been able soldiers (being Ottawa, we’ve even had REAL soldiers!) who have guided the organisation through some pretty rough waters at time. The long-time (former as of last year) President (let’s call him “Kevin”) was and is one of the hardest working volunteers that I have ever worked with and is a true credit to his community. I hope he knows that. And I’m certain that the current President will be equally up to the task in the coming months and year. But I’ll miss this particular unpaid gig. My kids have “graduated” from that organisation now and I’m finding myself pretty stretched for time since taking on a bigger role at my Community Association. Still, I do not regret a moment of the many hours that I devoted to the organisation. If you haven’t already joined the millions of Canadians who give up part of their free time to give meaningfully to their community, then you might want to think about it. You too won’t regret a moment of it. … in the Aviva Fund competition. Hi all – PSA time: Clifford Bowey PS has moved into the Aviva Fund Semi-Finals! I like to think that our school community last year helped Vincent Massey win this competition – and a new playground! Please visit the site and register and VOTE – one vote per day is allowed. Spread the word and let’s help this very special school build a new accessible playground. … and give to a mighty worthy cause at the same time? You might remember some posts a while back about a wonderful young man – my wife’s cousin – who was ambushed by cancer. While Brian is now gone, his friends keep his memory alive by doing stuff like this in support of a charity that was dear to Brian’s heart. 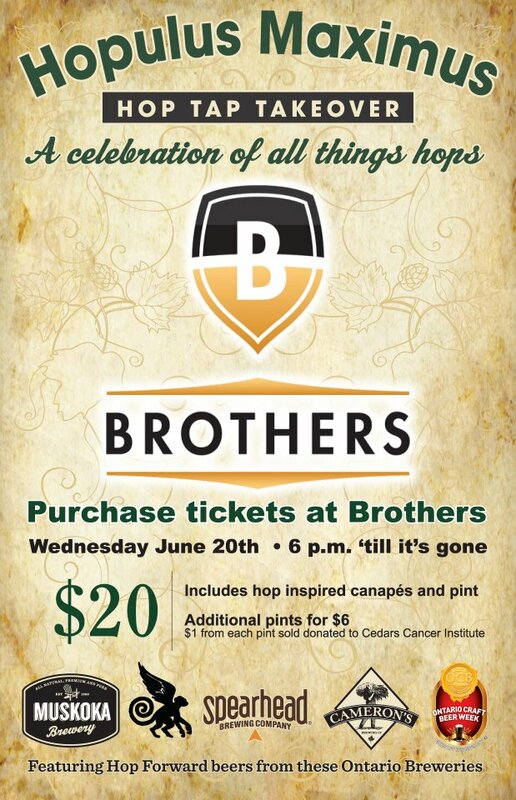 So if you find yourself free tomorrow night and are craving a decent beer, check out the brand new “Brothers Beer Bistro” on Dalhousie Street in Ottawa. It’s run by very good friends of Brian. They are hosting an event where a portion of proceeds will go to the Cedars Cancer Institute, a charity Brian worked very hard to support. … a good cause and a great show to boot! A colleague’s wife is running a half marathon for cancer in Alaska in less than two months. As a fundraising event they are hosting a concert by Juno nominated folk singer Craig Cardiff at the RCMP officer’s mess on May 19th. Please see the poster and links below. A percentage of the ticket sales will go to raising money for the Leukemia Lymphoma Society of Canada with the rest going to the artist. Even if you can’t make it (like me, as I’ll be about 10323.25 klicks away), feel free to pass this on to anyone you think would be interested). Information on how to get tickets, times and locations can be found in the links below. This concert is being held to help raise money for The Leukemia Lymphoma Society of Canada (LLSC) through Team in Training(TNT) participant Elizabeth Creary. Elizabeth will be travelling to Alaska, and participating in the Mayor’s Half Marathon on June 23rd 2012. Team in Training is a group of runners who train for marathons and half marathons while raising money for blood cancer research. It exists to find a cure for leukemia, lymphoma, Hodgkin’s disease and myeloma, as well as improve the quality of life of patients and their families.